The last Canadian miller, Robin Hood, has been sold to Americans, and I can't find decent white bread flour any more. All of it that I can find now has miserable gluten content, and all the mass market ones now have ascorbic acid added to try to make up for it. Has anyone found a Canadian source of good white bread flour (4g per 30 g 'serving' minimum) that doesn't have junk added (other than the legally required B vitamins, of course)? I've had very good luck with their flours including the whole wheat, unbleached white, spelt and rye. Superstore (Loblaw's) carries them here. In Quebec, there's La Milanaise - more expensive though. That's very sad that RH has been sold! Robin Hood hasn't changed their flour mix, still source locally grown Canadian grain, use local Canadian labor and the Canadians who once owned it made a pile of US dollars. Regrettably they have changed it. RH never used to have ascorbic acid added, and it used to have an exceptional nutty flavour that it no longer has. And, despite the ascorbic acid gluten enhancer, it doesn't rise as well as it used to. I measure these things. If you happen to be in the Ottawa area, I can suggest some sources. I've seen people post about good bulk Canadian flour from Costco, including discussion of who mills it although I don't have a membership so no personal experience. Have you tried Rainbow Foods on Richmond Rd? I get 10 kg. 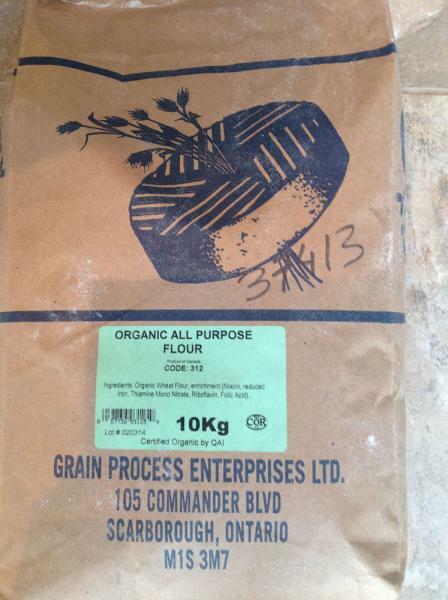 of Organic white flour for $35.69 and 10 kg. of (non-organic) white flour for $25.49. Both are from Grain Process (out of Scarborough, On). They do not contain ascorbic acid and contain 13% protein. Here are the package labels. That looks great, Julie - I'll pay them a visit. I hope it works out for you. They actually have a very nice selection of flours, both bagged and in bulk. I drive across town periodically to stock up. I also discovered the La Milanaise products are carried at La Boite in Gatineau. I've never found them in Ottawa so don't mind making the short trip across the bridge for that. I buy the Loblaw's no name unbleached flour and have never had any problems with it. I find the RH flour tends to have lumps in it and I wind up sifting it. Five Roses is way too expensive for me, akin to the RH. By the way, RH was sold to Smucker's years ago. How long ago was the change with RH? I hadn't used RH in about a year, then after running out of my local Anita's Mill flour, I used RH for the last few bakes and I didn't notice a performance difference at all. If anything, my last few bakes turned out better than when I used RH a year ago. Not crazy about the additive change, but I sure didn't notice a negative to the bake. 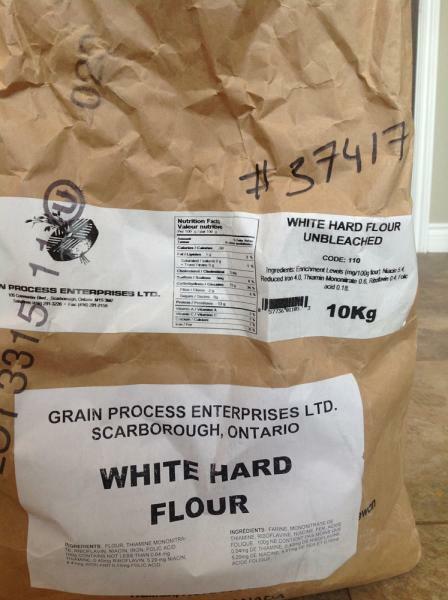 I buy the Grain Process Hard white (bread flour) and get it in Scarborough. Last time I was there I bought 2 x 20KG bags and it was under $50. Apparently you pay a lot more out east! Although I'd rather have no additives, I don't really see why adding ascorbic acid/vitamin C is any different than adding vitamin B complexes. I am also looking for a new flour. I might drive to Tavistock and check out Oak Manor Farms. It's really shameful that it's this hard to find something reasonable. Of course, we ship off most of our commodities so it shouldn't really be surprising. Unlike the B complex added to flour, ascorbic acid breaks down during baking into a mess of diketones - it doesn't stay vitamin C. It's only used to cover up cheap flour with inadequate glutens. Never really considered the reaction products. I'll have to read up on that, but it looks like that could lead to furan production as well....which is not appealing at all. I picked up a bag of Selection organic unbleached AP flour today that appears to be similar in spec to the RH flour without the additional ascorbic acid. I purchased it at Sobey's, but I plan on checking Fresh Co. as well. The Sobey's I went to also carried 1kg bags of Milanaise Rye, Buckwheat and Kamut flours. Selection Organic Flour also at Fresh Co. I stopped by Fresh Co. (the discount chain of Sobey's) and found they also sell the Selection organic unbleached AP flour. Same price though and only in the 2kg bags. They also had the non-organic version, which I didn't see at Sobey's, but it contained ascorbic acid. I also went to an Asian supermarket, Superking, today for other reasons and checked out their flour section. Interestingly they carried Nutrasun Foods Organic AP flour, so I picked up a couple of bags to try. The one thing I noticed about this flour though is the inclusion of silicon dioxide (which is likely acting as an anti-caking agent). They also carried a couple of Italian 0 flours, which I plan to try for some pizza dough at some point. Once I am actually a more proficient bread baker, I will post some results from these flours. Any suggestions for a good test recipe? Is there a standard recipe used for testing various flours or methods? I always start with my basic loaf and compare it with others. I've just picked up a 10 kg bag of Grain Process Hard White from Rainbow Foods and will be trying it shortly. There's an ingredient list but curiously no nutrition label on their flours there, so I've no idea as to the protein content... Isn't it strange - natural hard flour was the mainstay of bakers for so long - why can't more millers leave it alone for those of us who just love bread?? "I've just picked up a 10 kg bag of Grain Process Hard White from Rainbow Foods and will be trying it shortly. There's an ingredient list but curiously no nutrition label on their flours there, so I've no idea as to the protein content..."
Hi johnsankey. Did your 10 kg. bag of Grain Process Hard White not have the same label that I showed in the second photo in my previous post? Mine did have the nutrition info on the label. In any case, if you ask the staff at Rainbow foods, they will give you a print-out of the nutrition label. Julie, I took your word for it. My first loaf - it needs noticeably more liquid than even the old RH, rise is a bit slower, but good strong texture bodes well for my love of adding tasty extras for the flour to carry and taste is good with 20 minute autolyse - I'll try longer next loaf to accentuate it. you can call Grain Process and they should be able to give you the stats on the flour, as long as there is a date stamp on the bag. It's a little harder to get an open crumb when ascorbic acid is present in the flour. The crumb tends to be finer no matter how much water you add. In fact, too much water makes an inferior loaf imo so it's best to make a drier, higher loaf with a finer crumb. Less hydration is best with ascorbic acid in my experience too. Since I love moist loaves, it's a double problem.